Disclaimer: All thoughts / opinions / experiences expressed here are my own and by definition, are very subjective. Also a bit biased. Your mileage May and perhaps Will vary. Front Sights: High Viz Fiber Optic, Red - Dovetailed, secured by a one time use pin. Rear Sights: Fixed. Bomar cut (Black broad serrated blade ) - Dovetailed secured by a screw. Grips: Soft rubber, Full checkered. Safety: Manual Safety, Trigger safety notch. No firing Pin Block. Much has been said about this handgun. First things first, it’s a CZ, a CZ that the CZ team itself (among many others) for limited IPSC and variants. The rest can be read up on the internet and a certain T shirt owned and proudly worn by our Chief. It’s a recent purchase and I have shot around 350 rounds (and counting) through this handgun and I must say, "The more, the merrier"
Scrubbing. Happiness. Dry firing. More happiness. Disclaimer II: Please note that I am not very experienced at pistol shooting and a novice at best. Got my range membership recently as well. In fact, it was my third time at the range when I shot the shadow for the first time. So, I do believe the pistol can do much better in the hands of a good shooter. The pistol shot beautifully. The impatient man pulling the trigger, not very much. The results were good none the less. Specially the pseudo rapid (one shot / second. ) target results shown below. This was shot with Chinese Polytech Ammo (White Box). Targets are 25m Precision Pistol targets. Things that stood out on day 1: The trigger creep. Pre travel had creep. The break had creep. Fortunately there wasn’t any post travel and the trigger reset was very good. Day two was better. I had more patience and shot much better groups. Targets follow. All shots were taken at 15 meters. Targets are standard NRA 25 m Precision Pistol targets. The First target is wrongly marked as a previous day target. Kindly excuse the error. Types of Ammunition fired: Armscor FMJ, Chinese Polytech FMJ, Wolf FMJ, FNH FMJ (Belgium) , POF FMJ, Tula FMJ. Stoppages: None what so ever. Looking Back / After thoughts. You pay almost equivalent to the US price (880 USD after discount) unlike other 500 ~ 600 USD pistols which are retailing here for 300 K onwards. Overall a wonderful purchase. I would love t get my hands on another one and just put it in my closet. Its just that comforting to own one. Trigger: A love hate relation. The trigger is much better now than what came out of the box. Pre travel has no creep now and the break is crispier. I m counting on the trigger to really shine once I cross the 1000 round mark. The shadow will take you for a ride if you want to do IPSC style shooting (speed) but it is a difficult pistol to shoot for precision shooting. Not very forgiving when it comes to trigger errors. You do something slightly wrong, and rest assured, it will be reflected on your score. Its just that way with precision machines I guess The CZ TS on the other hand, is very forgiving. But lets save the TS for later. 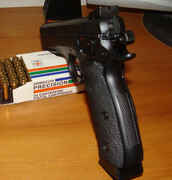 Recoil: This gun handles very nice in my hands. I can assure you of the fact that you will not wait to pull that trigger again, and again. Very little muzzle climb. The sights just hug the target as if tied down by an invisible bungee cord. It’s a pleasure to shoot.